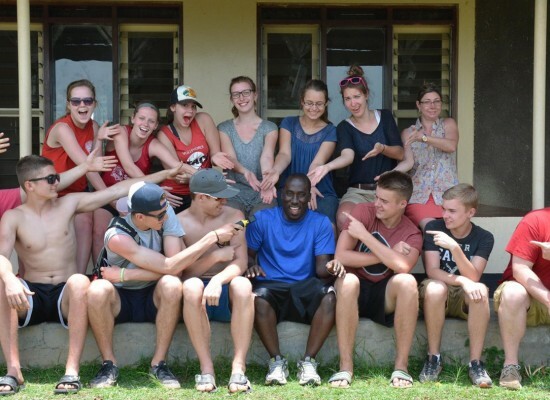 At March Break in 2016, a group of students and teachers traveled to Uganda. The following are excerpts from their FaceBook page logging their experience. We had a long but thankfully uneventful trip; we passed the time with movies, books, food, War, President, Hearts, Cheat, and Go Fish. We finally arrived exhausted (after almost 30 hours of travel time) at Entebbe airport at 3:30am Ugandan time. We woke up this morning after about two or three hours sleep to the sights and sounds of our lush tropical host country. It has been a hot and humid day of 32 degrees and we loved it! We went to Zana Presbyterian church this morning and listened to a rousing sermon about discipline. The music was boisterous and the enouragement continual. 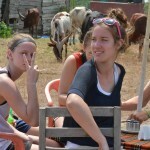 We then returned to the Persenaire’s with some of our church hosts to enjoy a lunch of goat stew. 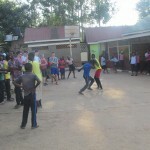 The students taught a couple of our friends how to play the card game “Cheat” and our new Ugandan friends taught them “Netball.” We had the opportunity to return to the church for the Youth Fellowship night. 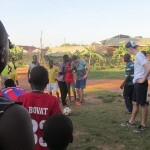 Caleb, Mark, Noah, Brandon, Zach, and Aaron played a team of competitive Ugandan youths rousing games of basketball and soccer (football), and Bethany and Esther joined the girls for a game of netball. 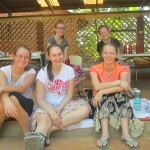 The rest of the crew remained at the house to nap or play cards with other Ugandan friends. We took a break and returned to the church for a youth service. We listened to a speaker and worshiped together; a highlight for me was joining our voices to those of our hosts as they sang 10,000 Reasons. So different, and so beautiful. We are enjoying some down time playing cards, chatting, or journaling to an unbelievable chorus of frogs in the hills behind us. God is good! All the time. 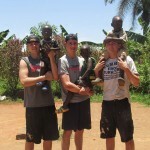 It’s been an incredible Day 2 here in Uganda. A very special happy birthday today to Esther Wonder! We awoke to the amazing smell of pancakes cooking on the griddle; we all ate a mound! 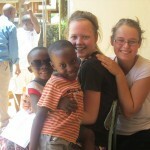 Then it was all of us bundled into the two vans to head into Kampala to work in the Nkumba orphanage. With the heat and humidity, the day’s tasks presented quite a challenge! First we washed walls and swept floors, and then we painted, and painted, and painted. After a lunch break we were joined by some of the children from the orphanage who were clearly eager to make friends, take selfies, try on sunglasses, play with stickers, and throw down some slam dunks (with some assistance). We managed to strike a pretty great balance between making lots of new friends and working our apple carts off! 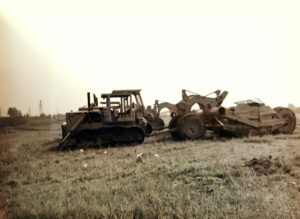 We worked until late in the afternoon. Exhausted, we then piled into the vans to head to a hillside pool oasis to cool off. You’ve never seen people get into a pool so fast! The water was balmy and the view was incredible! Back into the vans we went to enjoy hot gooey pizza back at the Persenaires’. After hanging around a bit on the patio, we gathered back into the main room to be led in devotions by Caleb and Lauren, who asked us to consider the ways that our trip has influenced our views on creation, evangelism, and thankfulness. We ended the day with a rip-snorter of a euchre tournament. The chirps were flying! I didn’t think there could come a day to top yesterday, but I was wrong! I wonder if that will be how it goes this week: one amazing day after another! We started the day with a worker’s breakfast of scrambled eggs, toast, and fruit. We piled into the vans again, and as we did Bethany wondered if it was actually hotter today than yesterday. 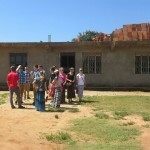 We went straight to Nkumba orphanage to finish the work we had started yesterday. We needed to finish painting the bedrooms we had started (ceiling and floors), as well as the bathrooms and the entire outside of the dormitory. 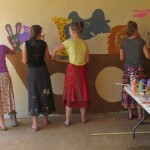 Several of the girls were also tasked with creating a mural to decorate the wall of the outdoor student lounge. There was a lot of debate about what to paint. I think what they came up with was a beautiful portrayal of our faith and unity in the Biblical story. Check out the finished product in today’s photo highlights. It was verrrry hot with the temp topping out at about 33 degrees, so we took frequent water and snack breaks. We worked so hard that we finished all the painting a bit early, which gave us some quality time with the students from the orphanage. At one point we heard the sound of students singing and discovered that it was time for chapel, which was being held outside under the shade of a huge tree. We tentatively headed toward the sound and joined them quietly in the background. What an amazing experience. Finally, it was time to go. I’ll be honest: it took us a long time to say goodbye and we found it hard to go. I took some video footage throughout the day, and I chose a couple of favourites to post. We loved the pool we went to yesterday so much that we asked if we could go again. We enjoyed another hour cooling our body temperatures back to normal and looking out at the incredible view. We then headed back to the Persennaires’ house. 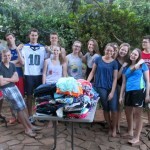 After a short break we got to work sorting out all of the clothes that we brought from home. What a lot of great stuff! The Persennaires were absolutely thrilled, and we were pretty proud of all we had done. We sat down together and enjoyed a delicious meal of pork chops, rice, and fresh pineapple with our hosts and some of our new friends. 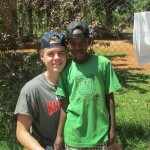 Brandon and Noah then led us in devotions that focused on the joy of loving. They asked us good questions like why we came on this trip and how we envision meeting the needs of our own group and those of the world based on what we have seen and learned. Great discussion! That’s all for now… Time to play some cards. We were not able to get internet access yesterday so here is a quick post to recap yesterday’s events. 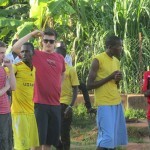 We left fairly early yesterday morning to head to the town of Masaka to work on the grounds of a second orphanage. The trip took about 3 hours but we had a great time on the way. 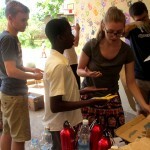 About halfway through the trip we stopped for “street food” by pulling into the Ugandan equivalent of a service center. What that meant was that men and women selling cold drinks, roasted banana, and hot goat skewers came rushing up to the car windows to sell us their wares. There was jostling and hand waving and loud talking as they tried to convince us to purchase from them. When some of the young men realized that one of the vans had a car-load of young muzungu women in it, they rushed to the rear windows of the van, pressing their hands up against the tinted glass to get a better look. The young men smiled and pointed, and our girls giggled away. I’m pretty sure Lauren got a marriage proposal at one point! 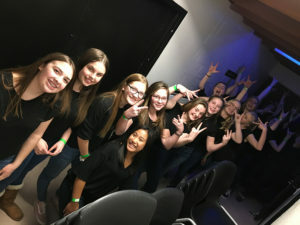 In any case, the girls felt weirdly like rock stars. 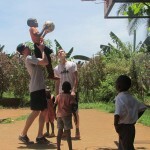 The boys passed the rest of their trip filling out their March Madness brackets and playing President. The girls and I sang Taylor Swift songs with our driver, Ronnie, at the top of our lungs. 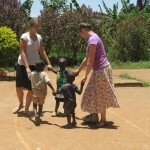 When we got to the orphanage we got straight to work. 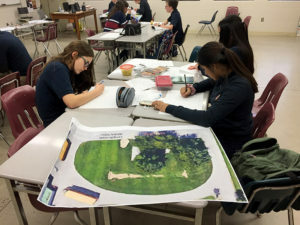 We had three tasks: we needed to mix mortar for the brick wall they were building in the new latrine, to level a giant mound of clay and dirt into the surrounding field in anticipation of a new playground next year, and to paint a mural to brighten one of the girls’ bedrooms. Noah and Brandon got to work quickly on the mortar, several of the girls went to paint, and the rest of us started shoveling dirt into wheelbarrows to spread around the field. Did I mention it was 33 degrees again? Only this time, there was absolutely no shade where we were working. The students were incredible. I had to drag them off the field for water and shade breaks because they were so determined to get the job done. 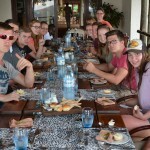 One of our breaks included a traditional Ugandan lunch with papaya juice, rice, steamed banana and sweet potato, beans, and goat meat au jus. Delicious! We finished all three of our tasks by mid afternoon and were happy to have lots of time to spend with the kids from the orphanage. We took selfies, played with sunglasses, gave high fives, and had a huge game of soccer. 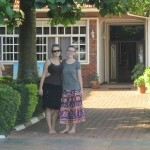 Exhausted and utterly drenched in sweat, we headed to a hotel back in Masaka. After showers and some rest time, we enjoyed another traditional Ugandan meal served outside on their beautiful grounds under a big white tent. I’ll post pictures later. 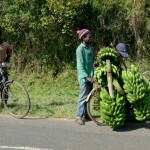 It was another great day in Uganda. Now we’re off to Queen Elizabeth National Park and our two day safari adventure! I’ll make a quick post to save some time since days are full and internet availability is limited. Here are some highlights from yesterday. We spent most of the day in the car traveling from the second orphanage to Queen Elizabeth National Park where we will be doing our safari. On our trip we stopped at some grasslands where wild zebras run free; we took some pictures and marveled at how zebras are such quirky and yet such beautiful creatures. We also stopped at a city hospital along the way to check out Caleb’s eye. Caleb’s contact lens shattered in an encounter with Zach’s arm the evening before, and we wanted to make sure there was no glass remaining in his eye. Thankfully, he got a clean report and we continued on our way. Later in the trip we stopped at a lookout at the park entrance to check out the spectacular views. 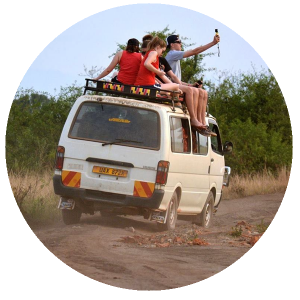 Once we checked into our hostel on the park grounds we hurried to make our boat trip along the Kazinga channel, where we saw hippos, water buffalo, crocodiles, and many species of birds. We then returned home and enjoyed a late spaghetti supper on the patio while we watched the sun go down. Alex and Leah led us in devotions after supper, and we rounded out the evening playing the Korean game Kungi and a game called “Who’s the Pope.” Until next post…. We got up early to head out to the savannah. 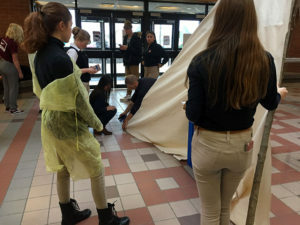 We loaded our two vans with our water and backpacks, and we strapped some mattresses to the roof racks of the vans so students could get a better view. We picked up our guide and set out across a fairly dry landscape to see if we could see animals in their own habitat. We saw a number of antelope and their bigger cousins, the water buck, water buffalo, and a number of elephants in the distance. Although it was intriguing to see the animals, we were a bit disappointed to hear that the number of animals were down significantly from previous years. Usually the animals are present in abundance, but because of the hot, dry weather many had moved away from the safari trails to be closer to the water. After the safari we went back home to have a lunch of mac and cheese and to clean the dirt and grime from our faces. We had a bit of down time and later in the afternoon, we put on our best clothes (that we had with us anyway!) and went to the lodge for a fancy dinner. The views were spectacular and the company was delightful. We closed the day with a rousing game of Telephone Pictionary. We fell into bed exhausted. Saturday will be a long drive home. 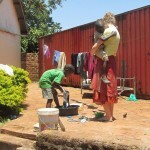 At 7:30, we packed up our belongings from our hostels into the two vans and began our 7 hour trip back to Kampala. 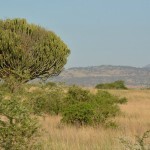 For some, it was interesting to see the landscape shift from the grasslands of Queen Elizabeth National Park to the lush green hills and tea plantations of the Rwenzori Mountains. For others it was a great chance to catch up on some sleep! Our ride was uneventful until the engine blew on one of the vans and we all needed to pile into the one van for a ride into the nearest town. In Mubende, we caught a Matatu (taxi) to take us the last three hours into Kampala. (I think we made the driver’s week!) 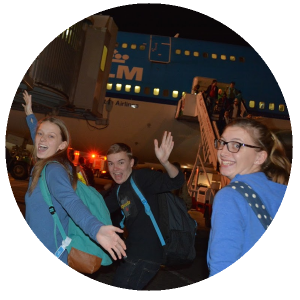 We thought it was pretty crowded to fit 16 people in a fourteen seater van but Rick and the Ugandans laughed at us and said we were lucky that there were no live sheep or chickens or bags of grain to deal with and our trip was actually luxurious! After all of this adventure, we returned to the Personaires and ate hamburgers and roasted pork and relaxed for the evening. Mrs. Boonstra led us in devotions and prayer and then some played cards and others just went to bed after a long day. Tomorrow’s plans are still up in the air so you will need to check in tomorrow! It was great to be back at the Persenaires’ again. We all enjoyed sleeping in and devoured a pancake breakfast. A few of us have been feeling under the weather, and so I was happy when all but one decided to go to Zana Presbyterian Church for their worship service this morning. It was another hot day, but this week there was little to no air movement in the church. We all really enjoyed the choir and the music, but the heat became a bit too much for several students, and they needed to step outside into the shade and the breeze. Ronnie was kind enough to take them home. The rest of us enjoyed the service and walked home. Hey all, we are just waiting for our flight to get us back to Canada! Our flight is scheduled to leave on time. Our flight number is KL0691. 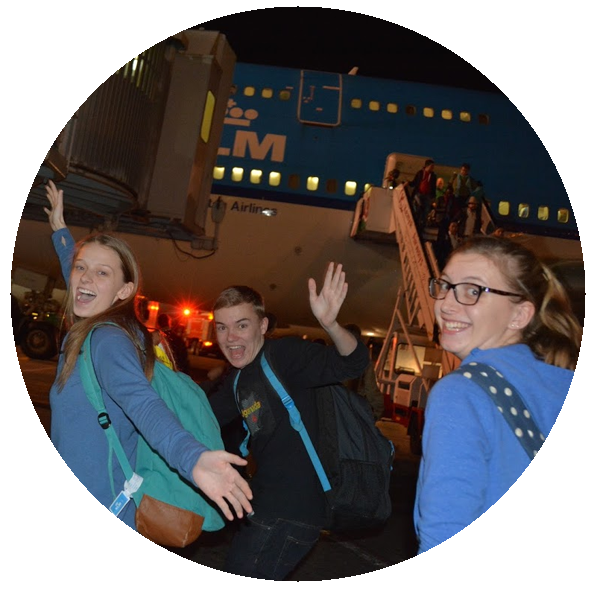 Check with Pearson to double check our arrival. See you soon!